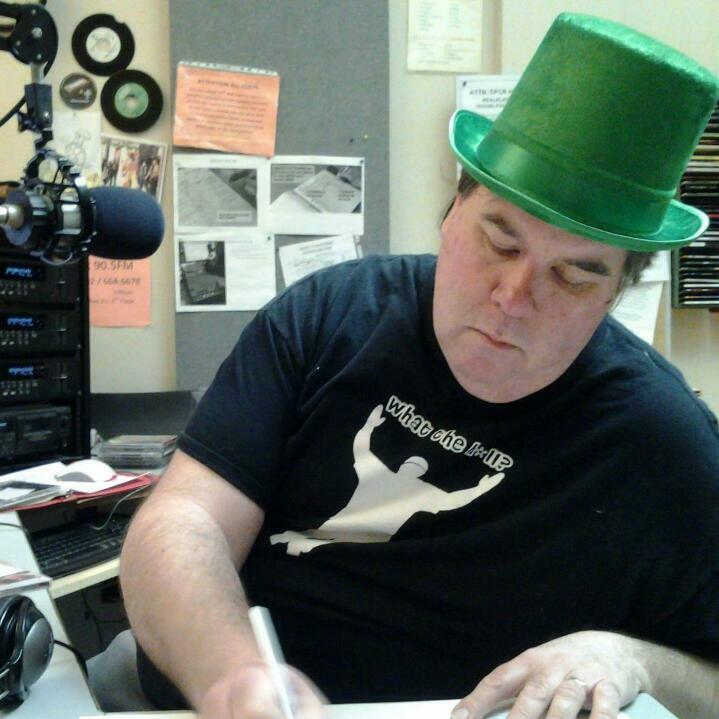 This month, we're getting to know Monday 6-8am Green Eggs & Ham host Pat Kindrat, aka Rat Stevens. Pat started off at CFCR in 2012 as the host of Rat Stevens Radio Show on Sunday nights, bringing listeners a blend of rock, power pop, Americana, folk & Celtic flavour. In 2014, he moved to hosting every other Monday morning, but his musical selections remain just a diverse and amazing. Pat has also been an eager volunteer off the air. He has pitched in at a variety of CFCR events and fundraisers, where his friendly smile and demeanour are always welcome. I’ve been a listener since the early days of the station. I stumbled across it quite accidentally after moving to Saskatoon in 1990 while twiddling the FM dial and loved the diversity of the music that was being played. It fit right in with my broad-ranging musical tastes! My friend and I used to switch the background music where we worked at the time to CFCR so that customers who phoned in and were put “on hold” would have something interesting to listen to instead of the other mundane Top 40 stations that were usually played while on hold. After being away for a few years, our family moved back to the Saskatoon area in 2005. A few years later, as my children grew older I became more involved in the local music community by doing some concert promotions and got in contact with CFCR about advertising. After meeting some of the great people working at and involved with the station I wanted to help out as well and started to substitute host in 2011. That led to doing my own late night show for a few years and now alternating Monday mornings on the early edition of Green Eggs & Ham. CFCR is important to our community for a number of reasons. It gives much needed exposure to local musicians as well as artists who are on tour and don’t play the “big venues.” By playing their music and helping advertise and promote their live shows, CFCR’s loyal listeners learn so much about new music that they may not have been exposed to otherwise. I also appreciate that the station provides air time for so many different cultural and special interest groups, and is a voice for the LGBT community in the city. When I used to do my late night show (Rat Stevens Radio Show) I had a loyal listener who would often call in to chat. He said he enjoyed my show so much that he was working on a special poster of the show for me! He was pretty descriptive about it and it sounded like it was going to be awesome but sadly it must have got lost in the mail because it never materialized. I think one of my favorite on-air music moments was when I did an audio mix of "Danny’s Song" by Anne Murray with "Anthrax" by Gang of Four. The results were surprisingly good! I really enjoy listening to the records played on Nightwaves and Pirate Radio, as the hosts have similar musical tastes to my own. I also tune in regularly to Green Eggs & Ham driving into work in the mornings and Hot Buttered Soul over the noon hour. There are some great local bands in Saskatoon right now. Two of my favorites are The Whiskey Jerks and Radiation Flowers. For Non-Local bands, there are so many I love, but The Damned and The Pogues are two of my all-time faves. I’m having a great time right now playing music with friends and family in our own recently formed band called Bagpipes & Beavers. We have influences of Celtic, Rock, Folk, Punk & Rockabilly & Country and haven’t ruled anything out as to what our band should or shouldn’t sound like. We’re currently working on some original music and hope to perform more in the coming months. In the band, I play electronic bagpipes, Great Highland bagpipes and small pipes, whistles and bass. My favorite pizza is loaded with no pineapple and no olives or anchovies. Lots of cheese! To tell you the truth, I’ve been so pre-occupied with all the drama surrounding the U.S. political scene that it’s got all the entertainment I can really handle right now! Reality TV at it’s most fascinating and disturbing! Below is a list of songs that will give you an idea of what Pat might play on his radio show, so get up early on Mondays and rock out with CFCR! Peter Case - "Ain’t Gonna Worry No More"
Neck - "Always Upsettin’ Somebody"
Three O’Clock Train - "Love To Rain"
The Kinks - "Waterloo Sunset"
You could be the host of one of our existing daily/weekly programs (like Green Eggs & Ham, The Buzz or The Swing Shift), or you can pitch your own idea for a show to CFCR Program Director Jay Allen. You can contact Jay at the station by calling (306) 664-6678 or by emailing pd@cfcr.ca.Your friends and neighbours will envy you, and you may even be featured here, for all the world to see--er--hear!